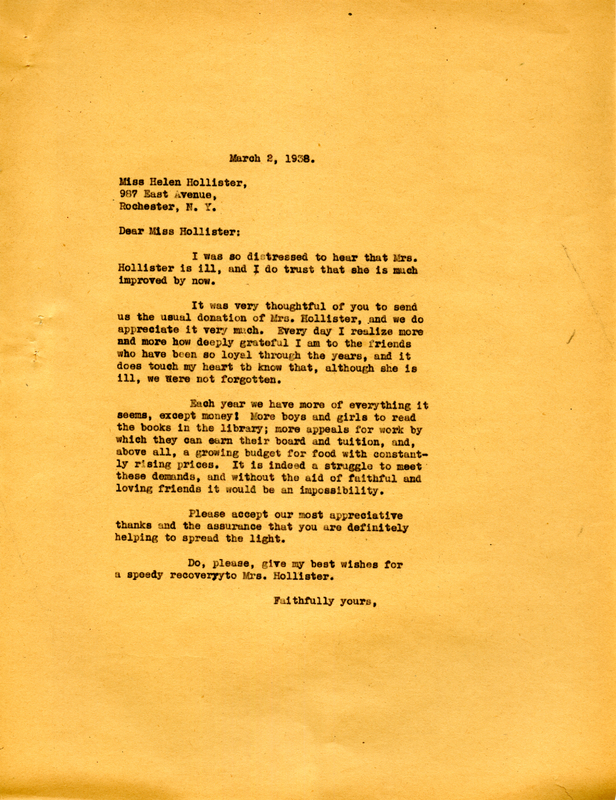 A letter to Miss Hollister from Martha Berry thanking her and Mrs. Hollister for sending their usual donation. She goes on to describe their rising need for financial assistance at Berry this year, and how much their help really impacts Berry. She goes on to say how touched she is that Berry was remembered even while Mrs. Hollister is so ill.
Miss Martha Berry, “Letter to Miss Hollister from Martha Berry.” Martha Berry Digital Archive. Eds. Schlitz, Stephanie A., Camille Hanner, Jessica Hornbuckle, et al. Mount Berry: Berry College, 2016. accessed April 26, 2019, https://mbda.berry.edu/items/show/14596.